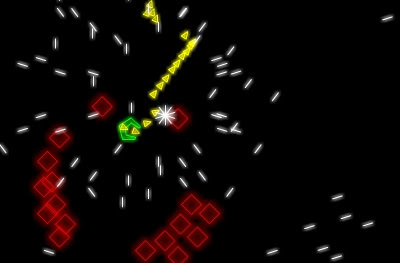 I recently noticed that Keith Peters' 25 lines competition and all the entries have been purged from the internet, so in case you missed it first time, here's my port of a Geometry Wars style game, with source code below. Click to view. Here's the source, under free for commercial or non-commercial use MIT license. It gets cut off quite badly by blogger, so you're better off just clicking here to download. To run, just paste it into the timeline of CS4/CS5. I know that's a bad way to do things, but it was the rules of the original competition. If someone wants to make the necessary tweaks to compile it under the Flex compiler, I'd be very happy to post their code. Enjoy! // INSTRUCTIONS: PLEASE NOTE IT CAN TAKE A WHILE BEFORE ENEMIES APPEAR SO PLEASE BE PATIENT! The Essential Guide To Flash Games... infomercial?! Help! How do I generate classes for a new project? I've also posted this on Stack Overflow. "First, inside of FlashDevelop access “Tools > Application Files” from the menu. This should open an explorer window where you see a few folders. Drill down into the following folders: Templates > ProjectFiles > AS3Project." Duplicate FlashDevelop's AS3 project and add whatever classes you need (FD/Projects in Program Files).